My mom’s classic mint brownies were a favorite in our family growing up. 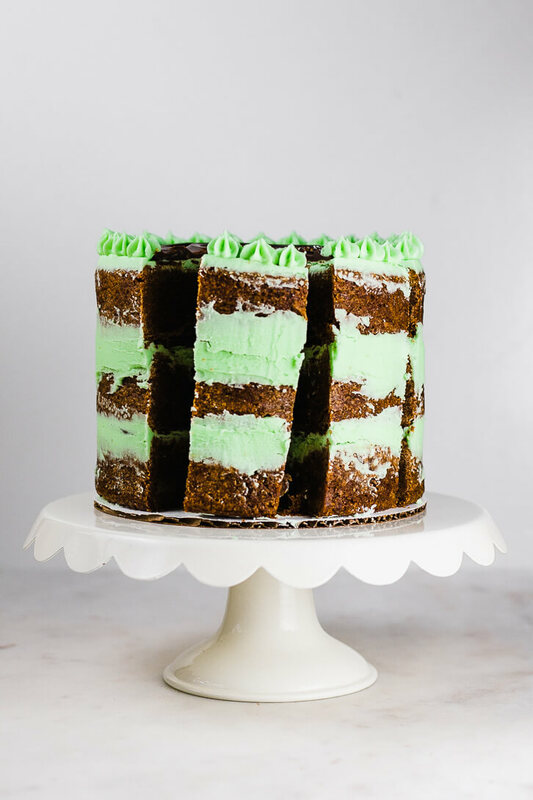 This three-layer mint brownie cake, filled with chocolate ganache and a mint-flavored buttercream, uses the same recipe, just baked in six-inch round pans! Some of my taste testers called this chocolate mint brownie cake the best cake they’ve ever had. I smiled and responded, “well… to be honest, it’s basically just a brownie!” But I knew exactly where they were coming from because, brownies vs. cake aside, the fundamental elements of this recipe have been a tried-and-true favorite in my family for years. And with very good reason. Growing up, my mom had two go-to recipes for whenever she needed to bake a treat for the office, an event, or our school. One was her mini cheesecake cups (made with vanilla wafer cookies as the crust), and the other was a chocolate mint brownie recipe passed down from my grandmother. I have so many memories of my mom baking a big pan of these fudgy brownies, topping them with the refreshing, mint green buttercream, and smoothing a layer of chocolate ganache over the top. Sometimes, she would add nuts into the brownie batter too, which added the perfect crunch. This is a recipe that I’ve known I wanted to share with you for some time, but I had the idea to shake it up a bit and turn it into a chocolate mint brownie cake. It took a couple tries to get it right, but the end result is still almost identical to the recipe my family knows and loves – just baked in six-inch round pans rather than rectangular. The biggest challenge I faced with converting this brownie recipe into a layer cake was trying to remove the layers from the cake pans after they were done baking. Brownie cake is so good, but sticks to the pan more-so than traditional cake. The key, I found, is to line not only the bottoms, but also the sides of the pan with parchment paper. Bonus tips: grease and flour the pans very generously and run a knife around the edges of the pan before removing the cakes. For the mint frosting, I decided to flavor it with peppermint oil , but traditionally, my mom used peppermint extract. You can use whichever you prefer, but just be sure to get the measurements right! Peppermint oil is more concentrated than peppermint extract, so you’ll need much less of it. Peppermint oil/extract is clear, so in order to get that nice mint coloring we all know and love, you’ll need a little bit of food coloring. I always recommend using gel paste food coloring, like these AmeriColor gels . They are more vibrant and will help avoid having to add too much liquid to your frosting. All I needed was two drops to get the green hue in these photos! I hope that this chocolate mint brownie cake soon becomes a favorite for you and your family/friends as well! I doubt there will be any leftovers, but just in case, I suggest wrapping them tightly with saran wrap and storing in the refrigerator. My mom's classic mint brownies were a favorite in our family growing up. This three-layer mint brownie cake, filled with chocolate ganache and a mint-flavored buttercream, uses the same recipe, just baked in six-inch round pans! Preheat oven to 350 degrees Fahrenheit. Prepare 3 six-inch round cake pans by lining both the bottom and sides** with parchment paper and very generously buttering and flouring the pans. In a small saucepan, melt the chocolate and butter together over low heat, stirring frequently. Set aside to let cool slightly. In a large bowl, beat together the eggs and sugar until completely incorporated. Pour in the melted chocolate mixture and whisk to combine. Add salt, vanilla, and flour, then mix well. Divide evenly between the three cake pans, then bake at 350 degrees for 38-42 minutes. Top will be crackly and a toothpick inserted into the center should have a significant amount of moist crumbs attached (if toothpick comes out wet with batter, it's not done yet, but it shouldn't be totally clean, that means it's overbaked). Remove from oven and let cool for 5-10 minutes on a wire rack. Run a sharp knife around the edge of the pan to loosen the brownies, then turn out each layer onto a wire rack to cool completely. Cream the butter until light and fluffy, then gradually add powdered sugar. Once incorporated, add peppermint oil and salt, then add cream one tablespoon at a time, mixing on low to incorporate. Add food coloring, then beat until incorporated and buttercream is smooth. In a small saucepan, melt the chocolate and butter together over low heat, stirring frequently. Once completely melted, remove from heat immediately. Pour into a glass jar or heatproof bowl, and let cool until it reaches a spreadable texture. Secure the first brownie layer to a six-inch cardboard cake circle, or directly to a cake stand, using a small amount of buttercream. If desired, set aside some of the buttercream for piping on top, then spread about one third of the remaining buttercream on top of the first layer. Using an offset spatula, spread the frosting slightly beyond the edge on all sides. Top with about a third of the ganache and spread evenly on top of the buttercream with an offset spatula. Repeat with second layer, then top with third brownie layer, bottom side up. Top with the final third of the mint buttercream and ganache. Smooth the sides of the cake with an offset spatula or bench scraper. If desired, pipe any set-aside buttercream on top of the cake. Cake is best served the day of, or the day after, but it will keep for a few days in the refrigerator. I recommend sealing the sides of the cake with saran wrap to store. **Brownie cake can be difficult to remove from the pan. I highly recommend lining both the bottom and sides with parchment paper. Here's my method: butter the entire pan, then stick a circle of parchment paper to the bottom. Next, cut out a strip of parchment paper as wide as your cake pan is tall (2-3 inches), make it into a ring, then line the inner side of the cake pan as well. Finally, butter and flour the entire pan, on top of the parchment paper. Made this recipe? Share a photo on Instagram and tag @flourcoveredapron so I can feature your creation! Omg Haley wow! Just wow!!!! Chocolate and mint is my most favorite combination.